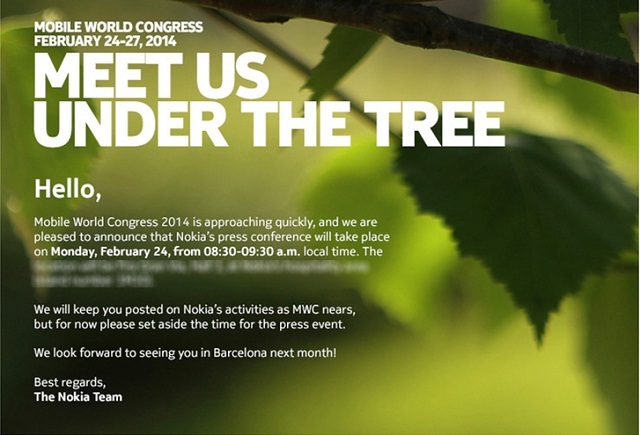 Nokia has handed out invites for Mobile World Congress 2014. Like Nokia’s last event, the Nokia World 2013, Nokia is set to release a deluge of devices. The devices that are expected to be released by Nokia at MWC include the Nokia Lumia 1820 phablet, Nokia Lumia 1520 siblings – the Nokia Lumia 1520v and Nokia Lumia 1525 and finally the much awaited Nokia Android phone – the Nokia Normandy. While the Nokia MWC invite doesn’t say too much, this is the stuff that’s been brewing about. Let’s cut to the chase and dig into the specs, starting with the Nokia Lumia 1820. The Nokia Lumia 1820 is expected to come with the Snapdragon 805 processor inside, 3 GB RAM, a 5.2-inch 2K screen, 3400 mAh battery and 32 GB MicroSD support. Not just that, it will also come with astounding features like a Xenon Flash and Lytro-like refocus camera. In terms of being top-end, it is expected to outdo the Nokia Lumia 1820. Then, there is the Nokia Lumia 1525 which will come with similar specs but a 25-30 megapixel camera. The Nokia Normandy is the next phone which is pretty great too. It is almost certain that Nokia will release an Android phone before the deal with Microsoft finalizes. Rather than a high-end phone, it might just be a budget phone which will have features such as Android 4.4.1, a 5-megapixel camera and an 854 x 540p display. The other thing on cue is the Nokia Lumia 1520v which should actually be called the Nokia Lumia 1520 Mini since it comes loaded with the same features such as the Lumia 1520, except since it will be a cheaper version of the handset, some features have been downgraded. It will come with 4.3-inch screen though it will be full HD like the Nokia Lumia 1520. Besides, there would 2GB RAM, 32 GB storage, Snadragon 800 processor, 3000 mAh battery. It will come with Windows Phone 8.1 inside, while the camera will be a 14-megapixel one. Additionally this phone too will wirelessly charge. The event is taking place in Barcelona and might be the last large reveal from Nokia before the Microsoft buyout is complete.